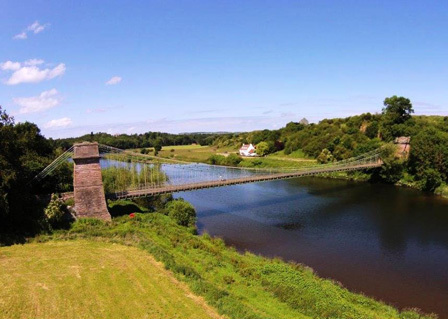 We have successfully tendered for the role of Conservation Architects for the Development and Delivery Phases of the £7.3 million project to conserve the Union Chain Bridge near Berwick. The bridge is Grade I listed and is on both Historic England’s and Historic Scotland’s At Risk Registers. We worked throughout 2017 with Northumberland County Council to understand the complexities of the bridge, leading towards a Lottery Fund submission. Heritage Lottery Fund (HLF) was approved in March 2018, enabling the project to progress further. On completion of this development phase, the project will then submit more detailed proposals to HLF to secure a full grant of £3.1m. We are working with Scottish Borders Council, Northumberland County Council, community group The Friends of the Union Chain Bridge, and Museums & Archives Northumberland. The work is due for completion in spring 2021. Union Chain Bridge is currently the oldest operational suspension bridge in the world, still carrying vehicles and through securing National Lottery support, it is anticipated that the project can also deliver numerous cultural, heritage, educational and community benefits as well as the upgraded structural work ensuring a further 120 years of use. It is hoped to stage bicentennial celebrations close to the Bridge, during the Delivery Phase. As well as advising Northumberland County Council and Scottish Borders Council on all conservation aspects of the repairs and alterations to the Bridge, we will also be overseeing specialist consultant work. These will include Historic Paint Analysis, Petrographic Analysis of the masonry of the Scottish and English pylons and Historic Building Recording Surveys to Historic England Level 4. We will also be involved in the hard landscaping and interpretation proposals at the approaches at both ends of the Bridge. A full archival record of the work undertaken will be undertaken on the fabric of to accompany the historic material already discovered during our research work for the HLF bid submission in 2017.